Click on Picture. Save As. Use Social Media to promote your holiday sale or promotion to attract customers during the Holiday. 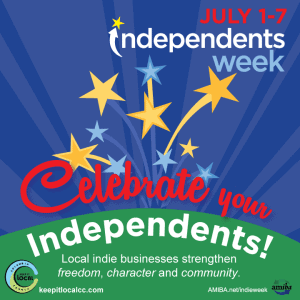 Columbia County, OR – American Celebrating Our Independents!—Keep It Local Columbia County and the American Independent Business Alliance (AMIBA) declare the week of July 1-7 Independents Week. Many local communities have celebrations that invite their neighbors, have family in from out of town to local celebrations. Local businesses are invited to offer sales and promotions around the holiday to promote shop small. “It’s a time to reflect on the importance of economic democracy and community self-determination by celebrating the nation’s locally owned independent businesses and the stake each citizen has in shaping their home town’s future,” stated AMIBA director Jennifer Rockne. 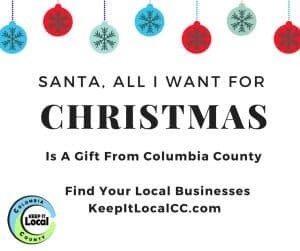 “Keep It Local Columbia County invites Columbia County to help celebrate by joining in activities around the county and in-store promotions offered by member businesses,” stated Natasha Parvey, Executive Director. Please see Keep it Local Columbia County Events page to view the events around the holiday. There are several ways for the business to get involved in this collaborative county-wide campaign! Catch the Holiday Spirit is a marketing campaign that has been used over the past seven years in some local communities to promote shopping locally. In 2015, Clatskanie Chamber mentored Rainier Chamber with this program. It works so well we launched a countywide campaign with local partners to create the tools for county campaign. The list of participating businesses will be printed on the Spirit Cards for their community and advertised on social media. Contact Keepitlocalcc@gmail.com to sign up for the Spirit Campaign or call 503-498-1699. Deadline is Nov 7th, 2018.
www.goo.gl/cNzNSN. And list your events for FREE on www.keepitlocalcc.com/AddEvents.